Halland There are 5 products. Modern shoes with an elegant style: oxfords with a rubber sole with a price accessible! An handmade shoe very particular, with very simple and particular form for a minimal style, we can find different models, with a particular closure, mostly for who loves the quality and recognize a particular product. High quality and class if you wear a woman loafers or a wingtip shoe, that adapt for the essential style of a man. Le linee di mocassini e francesine sono ideali per essere usate nelle occasioni in cui si ha bisogno di essere elegante senza mostrare eccessi, per la donne che hanno esigenze di stile in ogni occasione. 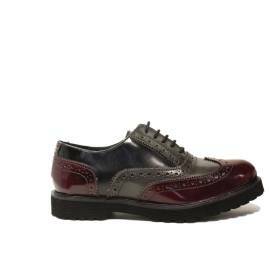 The loafers and wingtip shoe are ideal to be used in any situation, for an elegant style. To wear with a cigarette pants without excesses. For women that desire a complete wardrobe to wear in office or for special evening have the possibility to choose between a lot offers, that satisfy the also the most sofisticated taste. This brand is very original, elegant and refined. Every clothes created to fit and spotlight every woman with elegance and at the same time modern. Choose your favourite halland, you will not regret, over this the shipping service is very efficent. Bags and shoes available on our store online only on Young Shoes Italia, discover Cafè Noir shoes and bags on our store online an complet your outfit in your best way!